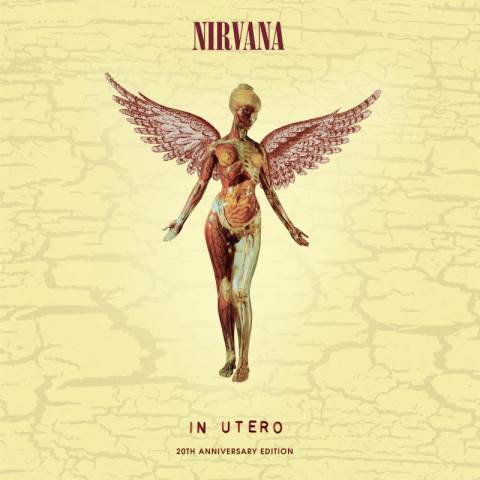 A 20th anniversary reissue of Nirvana’s 1983 album, “In Utero”, will be available in September. A multi-format release of the Seattle band’s final album spreads more than 70 remastered, remixed, rare, unreleased and live recordings over configurations ranging from a 3-CD/1-DVD Super Deluxe Edition to a standard digital/CD remaster of the original album. Material exclusive to the various versions of the "In Utero 20th Anniversary" reissue will include never-before-heard demos, B-sides, compilation tracks, and live material featuring the final touring lineup of Kurt Cobain, Krist Novoselic, Dave Grohl and Pat Smear...including the long-awaited release of the complete "Live And Loud" show from Seattle's Pier 48 on December 13, 1993. A stand-alone single-disc DVD of the complete "Live And Loud" show along with several never-before-released bonus performances will also be available. The follow-up to the 1991 breakthrough, “Nevermind”, “In Utero” debuted at No. 1 on the Billboard 200 upon its release; the project went on to sell more than 12 million copies worldwide, including 5 million in the US alone. A European tour to support the album was cut short following an overdose by Cobain in Rome on March 6, 1994; a month later, the guitarist committed suicide at his Seattle residence.